Trying to model a length of wooden trim. 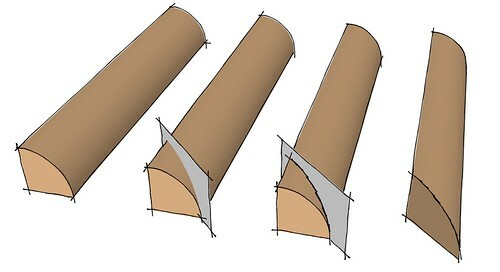 The piece is 1.5" X 0.75" X 42", and three of the four long edges are rounded over with a 0.25" radius. Each end is mitered at 45 degrees to match to an adjoining piece. I can model the straight piece with the edges rounded and the ends square, and I can model the piece without rounded edges and with mitered ends, but I can’t figure out how to round the long edges AND miter the ends. Any help would be appreciated. Draw a face that cuts through the trim piece at the miter angle and use Intersect Faces. Then erase the waste end. Although it doesn’t show in the screen shot, make the waste end plenty long. It’s easier to select what needs to be erased if it’s longer. I think the best approach is this: Make the straight piece with the edges rounded and the ends square. Make it a component and open it for editing. 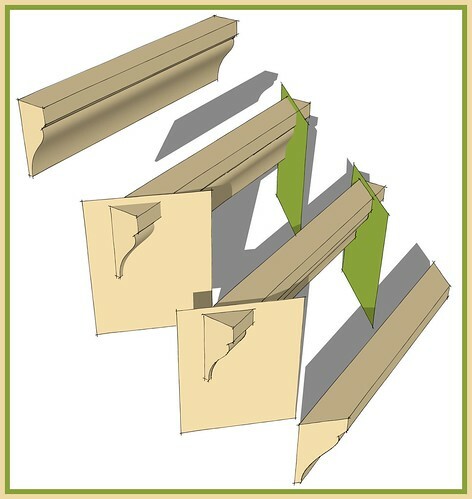 Create 2 “cutting planes,” rectangles that are larger than the piece of molding. Use the Rotate/copy tool to rotate them so they are 45 degrees to the long side of the molding. Select everything and go to Edit>intersect>with selection. Erase the ends of the molding and the cutting planes. You’ll be left with the rounded-over molding mitered at each end. The alternative, if you want to use a plugin, is to create the molding with square edges, miter it, then use Fredo’s round corner plugin to round over the appropriate corners. You don’t tell us whether you are trying to model each individual length as you might need for, say, a cutting list. If you are only trying to represent what you want, all you need do is to draw the section of your moulding, a suitably sized and positioned rectangle (assuming the item is rectilinear), and then use Follow Me to draw to finished article. This would not create a mitred face but it isn’t needed in a representation as it would be hidden from view.